The chimpanzee population along Africa's Ivory Coast, a region thought to be "one of the last strongholds for the species," has been decimated with an "alarming decline" since 1990, reports the BBC. Researchers estimate the number of chimps has crashed from 12,000 to 1,200 (a 90 percent decline) as the human population in the area climbed from 12 to 18 million. 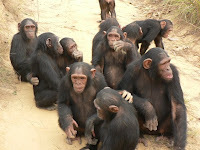 Swelling human populations lead to increased deforestation and poaching, a couple of bad things if you're a chimp.